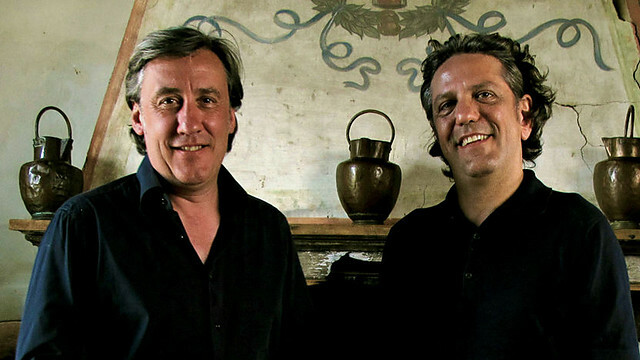 In my Top Ten Foodie & Travel Things 2012, I listed Sicily Unpacked as my favourite TV programme of the year and said, ‘I hope 2013 sees these two (Andrew Graham-Dixon and Giorgio Locatelli) getting together again for something similar.’ I had no idea that my wish was to be so soon granted for tonight, on BBC2, the first in a three-part series called Italy Unpacked saw the two doing something very similar in mainland Italy. The three programmes are based in northern Italy: Lombardy – where Giorgio comes from, Piedmont and, first of all tonight, Emilia-Romagna. Graham-Dixon, art historian and Locatelli, chef, bring together their separate passions and through their sharing and enthusiasm and generosity weave a coherent and entertaining portrait of the places they visit. Art plus cookery doesn’t necessarily make sense, but with these two it does. Beginning in Bologna, we’re told this is an area of abundance, power and richness. It is the birthplace of modern Italian cuisine, Giorgio tells us, while Andrew tells us of its rich cultural heritage and that its university is the oldest in the world. Giorgio goes shopping to cook a true Bolognese meal: tagliatelle ragu. He laughs at the description ‘spaghetti Bolognese’ and tells us no Italian would ever eat this – it’s something that grew out of the cuisine taken abroad by emigrants. We learn why northern pasta is different to southern and made with eggs, why ragu is better with tagliatelle than spaghetti. Then there is the whole question of tomatoes: the pasta lady sternly tells Giorgio he mustn’t put any tomatoes in the recipe, while the butcher whispers he should add just a little. Giorgio plans to follow the recipe of his hero, Artusi, the first person to put the concept of an ‘Italian’ cuisine into a book. However, Graham teases him when he strays to the butcher’s advice with his addition of a little tomato. What makes the programme work so well and is for me much of its attraction – as with Sicily Unpacked – is the strong and authentic rapport between the two men. Here, it seems, are two friends full of passion for the art and cuisine of Italy who have come together to share their knowledge with each other as well as us. One knows there must be an element of staging yet the programme unfolds with such a sense of ease that it all seems natural and draws you into their pleasure. And while to a certain extent the programme is about these two pillars of the art and cookery worlds, it is also as much about what they want to share. We do really learn a lot about art and about cookery and thus it is an intelligent programme that doesn’t allow its stars to overwhelm its subject. From Bologna the two men moved on to the Po Vallery and its lush arable farmland; then to Modena, which, Giorgio tells us, is home of two of his greatest passions: balsamic vinegar and fast cars. Modena is the home of Ferrari. Finishing in Parma we see the making of a special Parma ham and Giorgio tells us it smells so wonderful that if it was a woman he would marry her. The programme is full of humour too. The series brings together two of my own passions – food and art – and with two of the most natural and likeable presenters on TV, for me this is one of the best possible TV series to get the new year off to a great start. This was a wonderful summary! So interesting. Thank you, Judy. It’s a great series – I wish there were more than 3 episodes! But these are all in northern Italy so hopefully sometime they’ll go south. I thought that the series on Sicily was brilliant and would love to go there when time and money permit. Episode 1 of the new series was superb. I learned lots from both Andrew and Giogio. I am kind of envious that they drive around in a Maserati and also get a go in a Ferrari. These are the sorts of programmes that you can watch time and again, especially on cold and snowy days like today. Your blog on the show was really good and captured the essence of the location and the characters of the presenters. As usual the BBC did a great job in filming and production generally. Many thanks for your comment, Marek. Yes I hope they do the rest of Italy in more series. And agree, these are programmes to watch over and over again – though I don’t think SICILY in on DVD which is a shame. Yes, it is. Sicily unpacked is out in DVD. Thank you, Ivan! Good to know. Nice review which I agree with completely. Looking forward to watching the rest of the series. I just wish I could find that ragu recipe! Thank you, Rob. Yes they don’t do recipes do they? But I suppose if they stopped to give ingredients etc it would take away from something else. I’ve ordered the Artusi book though which is on its way to me from Amazon. Absolutely, but I was hoping that they’d put it on the website like the similar shows on channel 4 do. Never mind, I may look into getting the book too. I have the Elizabeth David one that was mentioned in the last series and that has some fantastic stuff in it. There is a good recipe in David’s ITALIAN FOOD. You might like to also check out my version – one of my early posts in Sept ’11 – you can find via Search button searching Bolognese ragu. Happy cooking! I love this show so much! It is amazing. I still need to make my way to Locanda Locatelli, I have heard such good things about it. Have you been? My review was about last year’s series … but I watched the latest and loved it too. No I haven’t been to Locanda and would love to. But one of my favourite places is Tinello – search on my blog – owned by Giorgio’s previous head chef Federico Sali (who I’ve interviewed on the blog) and Giorgio is part owner of Tinello. Fabulous food and very reasonable pricing. Amazing! I will definitely have a look at that. That sounds great, thank you for the recommendation. I will have to look at visiting Tinello. I’m sure you’ll like it. I keep going back! !